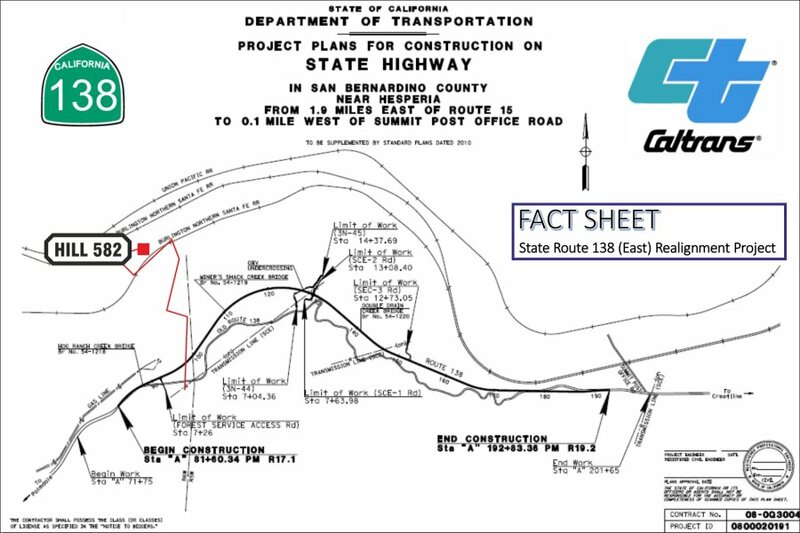 We are very thankful to Michael Amrine, who took the time to draw a special map with all tracks over Cajon Pass as it is today, 2010. We are having a great photo documentation of the 3MT Contruction by BNSF with more than 900 photos. Take a look, you will be impressed (links are below the map). October 14, 2016: Highway 138 (East) Realignment Project is now under way. The original track through Cajon was completed in 1885 with a ruling grade of 3%. The MilePosts were numbered from East to West starting at Barstow. In 1913, a two mile longer second main track was completed with a ruling grade of 2.2%. The NEW 1913 main became the NORTH (#1) track while the original track became the SOUTH (#2) track. Since there was a two mile difference in the tracks between West Summit Island and Cajon Jct, the new MilePosts for the North track were given an "X" to denote a separate track. 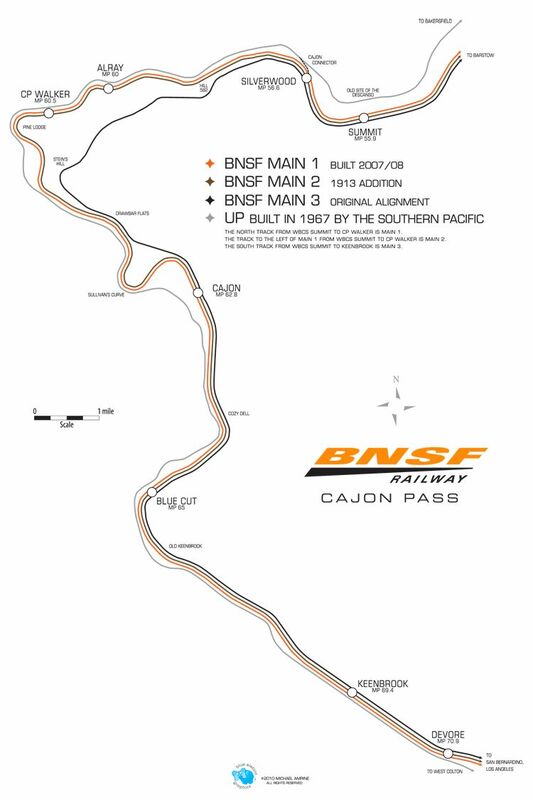 When the #1 and #2 tracks returned to parallel running at Cajon Jct, the newer North #1 track simply "lost" two miles and became MilePost equal to the original track. With completion of construction of the new Third Main track, the "MILES" on MilePosts on the #1 and #2 tracks were lengthened to about 1.15 miles each to coincide (at Cajon Jct) with the 1913 track Mile Posts. In other words, for railroad purposes the distance between Summit and Cajon is now considered to be the same for all three tracks, even though the actual distance is 1.15 miles between mile posts on tracks #1 and #2.